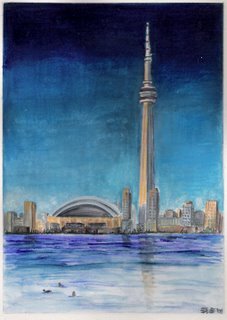 My sister Karrie is an amazing artist. Growing up, we hand-made all our relatives' birthday, Mother's Day, and Father's Day cards: she would draw the illustrations in marker or crayon, and I would write the messages on the inside. When we were in high school, we fought horribly, yet somehow managed to treat eachother amicably long enough to strike a deal: I would write her book reports for her, and she would do my art projects (we went to different high schools, so there was no way this subterfuge could be detected). Unethical? Of course. Mutually beneficial? Definitely. She inherited her talents (of which I have none) from my mother, who is also an artist and an art teacher, and my grandfather, who, as you know, carried this talent as well, and owned his own sign shop. 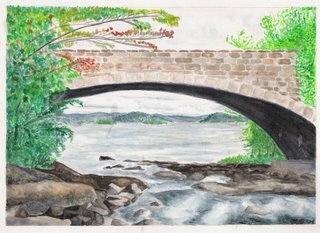 She excelled at art all the way through school, and for a time in college even considered a career in medical illustration. But, as she says, if she did art commercially, it would become a job and not a hobby, and she'd lose her passion for her work. So, instead, her family members benefit. She makes her own beautiful Christmas cards. She lends her talent to t-shirt design for the tv show she volunteers for. And, she created almost 20 watercolors to place on the tables at my wedding four years ago. On each table at the place where I had my reception, a 5 x 8 watercolor appeared on an easel. 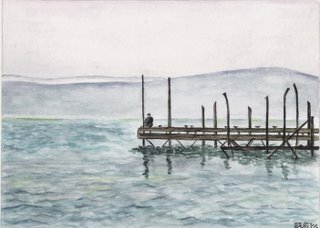 Each of these watercolors, on which my sister spent countless hours of her time, was representative of a place my husband and I had visited together during our dating years: London, Maine, New York, Ireland (okay, that was just me), Toronto, and the Finger Lakes in upstate New York, where we were engaged, among many others. We received so many compliments on these works of art from our from our guests, many of whom asked if they could take one home, which we didn't want to happen. 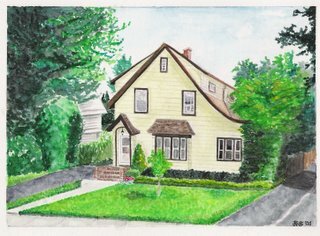 My sister gave me the gift of her time, talent, and love in each of those watercolors. I can't imagine a more personal and special wedding gift. And I am still so grateful for them...and of course for her. Stuck in a World Without "Ps" and "Bs"
I cannot say the "P" word. I'm lucky I can type it. Or tolerate others using it in reference to me. I also have trouble saying the "B" word, preferring instead to dance around the word by referring to it in abstract terms or to point to my stomach when talking about the "P" word . These words aren't vulgar or the kinds of words that would land you in the time-out chair if you uttered them as a kid. Nope. These words that I can't say aloud are "pregnant" and "baby." Now, it's not as if I haven't let these words pass my lips. When I had my spotting scare, I had to tell the doctor on the phone that I was 8 weeks pregnant. And I'm sure I've said "baby" aloud to my husband or friends at least a few times. But each time these words pass my lips, it feels...uncomfortable. Wrong, somehow, to be talking as if I actually AM pregnant (I still have a really hard time believing this) and that there IS actually a baby that will be born (I translate "whens," as in "when the baby is born" to "ifs" in my head). Saying the words aloud make something I am so terrified of losing real. And if it's real to me, and in a week's time, to my family, the potential loss will be devastating. It is a defense mechanism of self-preservation I've built for myself. It is the same one that kept me away from some friends' baby showers when I was struggling with infertility. It is the same one that made me avert my eyes when they landed upon a pregnant women in the grocery store. It is the same one that built the walls of the baby-proof life I lived in for so long. Because somehow, for me, not seeing babies and pregnant women helped me to believe that in my world, they didn't exist. Doing so prevented me from experiencing the very real pain that resulted from seeing that which I thought I'd never have. But now, apparently, I have it. Although it is still so unbelieveable. I know I need to live in the now, and embrace this pregnancy. I know I need to accept that nothing is under my control at this point, and that I have a greater than 90% chance of actually having a baby in my arms in August. I know I need to realize that the larger world of strangers that surround me, those who will wish me congratulations on my pregnancy and good luck with my baby will have no idea what I went through to get pregnant, and subsequently what havoc infertility wrecked on my brain. It's not as if I'm not happy. I am thrilled. It is instead that I am scared. I am terrified of embracing this pregnancy and this baby wholeheartedly, because I am so scared of what will happen to me should it be taken away. Do all expectant moms, regardless of how it was that they became pregnant, feel like this in the beginning? Did those of you with children embrace your pregnancy the minute that second line appeared on your test? What did you go through emotionally in the first few months? Today I am exactly 10 weeks pregnant. Today also marks the day that my embryo officially becomes a fetus. The baby is the size of a walnut, has all his/her organs, is growing fingernails and toenails, and he/she can now kick and swallow. All of this is completely amazing to me. I'm sharing a body with another human being! This morning also marked another milestone in my house. I officially retired my progesterone needles, and my battered and bruised buns have been granted a much-needed stay of execution. Every morning at 7am, since the first week in December, my dear husband and I have met in the dining room of my house for a date with a vial, a syringe, two needles, some alcohol, and a bandaid. He would shoot up my rear end with progesterone to build up the lining of the uterus so the baby would implant and begin to draw what it needs to develop from it. At ten weeks, the placenta takes over, and so this morning marked my last shot. Yay! Now we can sleep in past 7am on the weekends! The results of my first round of bloodwork at my OB-GYN came in, and luckily everything looks good so far. I am slightly anemic, though, which the nurse explained to me was very normal in pregnant women. The baby apparently saps all your nutrients, and leaves you with less than you need. So, I'm now taking an iron supplement, in addition to my prenatal vitamin. And we tried the fetal doppler we rented for the first time last night. We did it knowing full well we likely wouldn't be able to hear the baby's heartbeat yet (this happens most often for the first time at 12 weeks), and even though we tried for over an hour, we didn't have any luck. We did hear some sounds that indicate I may be growing an alien instead of a baby, though. So that added some excitement to our Saturday night. One week from today, we're telling our families. I was tagged by my blog pal Alisha to complete the 5 weird habits meme. After some deep contemplation, and a whittling down of a very expansive list, I have come up with 5, and only 5, which I will share with my reading public. Believe me, though, there are plenty more. 1. I cannot stand to have my fingernails grow, so I cut them down to the "quick." When I was little, I was a nail-biter. I would bite my fingernails constantly. My grandma tried everything to get me to stop, including painting my nails with this foul-tasting anti-nail-biting polish to make the whole process of chewing my nails less...appetizing. But I chewed right through it. I stopped biting my nails when I was a teenager, and instead resorted to cutting them down to the quick with a nail clippers each time one showed even the tiniest bit of white. I had a french manicure done the day before my wedding. I hated those fake tips things so much that I riped them off the next day. And this, my friends, is why I have the ugliest fingers on the planet. 2. I like to take scalding hot baths and showers. If my skin doesn't turn red, that means the water is too cool. When I take baths now, however, husband insists on putting this yellow rubber duckie he bought me in the tub with me so I don't cook our kid. This duck is meant to monitor the water temperature for bathing children, so you don't accidentally submerge your child into water the temperature of lava. If the word "Hot" appears on the duck's bottom, that means the water is too hot. Baths are a lot less fun now. 3. I don't like my food to touch on the plate, and I prefer to finish one food before starting another. I've always been amazed by people who load a little bit of peas, a little bit of mashed potatoes, and a little bit of chicken onto their fork, and then put it all in their mouth at the same time. Don't their tastebuds get confused? Anyone out there do this? Help me understand you! 4. I've never liked the bar scene, even when I was young enough to legitimately participate in the bar scene. Attending college in a small town with not much to do on the weekend presented a challenge for me. It was bars, frat parties, or...nothing. Give me a coffee shop and one or two close pals anyday. 5. I have a frequent nightmare that places me back in high school, standing in front of my locker, and not being able to remember the combination. The sense of panic I experience during this nightmare is unbelievable. I have probably had this same dream over 100 times. I have been out of high school for almost 12 years. Okay, well, actually he is. I mean Scientology? Please. Psychiatry is for sissies and post-partnum depression isn't real? Whatever, Napolean. And as for his daughter, ahem, I mean his fiance Katie Holmes? I'm sorry, but she will always be 16 year-old Joey Potter on Dawson's Creek to me. But, setting all this aside, he's truly not crazy for buying Katie her very own ultrasound machine because I just learned one very scary little nugget of truth. Most women get one, maybe two, ultrasounds if they're lucky DURING THEIR WHOLE PREGNANCY!! I don't know where I got the idea that I would receive a lovely little glimpse of my bambino at every monthly visit to my OB. Perhaps I had just become so accustomed to hopping up on the table and viewing my uterus and ovaries at my fertility doctor's for almost two years that I assumed I'd be treated to the same picture, but this time enhanced by the presence of a baby at each OB visit. Wrong. Wrong. WRONG. In fact, I've likely already burned through my alloted ultrasound quota because I've already had two: one at 7 weeks at my fertility clinic to make sure that there was, indeed, a baby in there, and one last week at 8 weeks after the spotting scare. This morning I had my first OB appointment with my OB-GYN doctor whom I haven't seen in a year and a half, since we've been going to the fertility clinic. My visit began with a rousing round of congratulations from everyone in the office-from the check-in receptionist, to the nurse, to my doctor, to the check-out receptionist, to the little old lady sitting next to me in the lab where I went afterward for bloodwork, to the woman taking my blood (ten vials!!!). It felt...strange. It felt as if they were congratulating me for something I haven't yet earned. Something that's not even real to me yet. And after each well-wisher was done, I felt this weird urge to say, "This wasn't easy, you know. This is an IVF baby. I'm not like normal pregnant women" But I didn't. The appointment itself was fairly routine. We went over family history of disease, the many genetic testing options we have to consider, where I would deliver, etc. My doctor did an exam and pap test, felt my uterus and said it feels just as it should for this stage of pregnancy, and then said she'd see me again in a month. But wait! What about the ultrasound? Then she lowered the boom. She told me the only ultrasound that's scheduled during pregnancy takes place at 18 weeks. 18 WEEKS!! 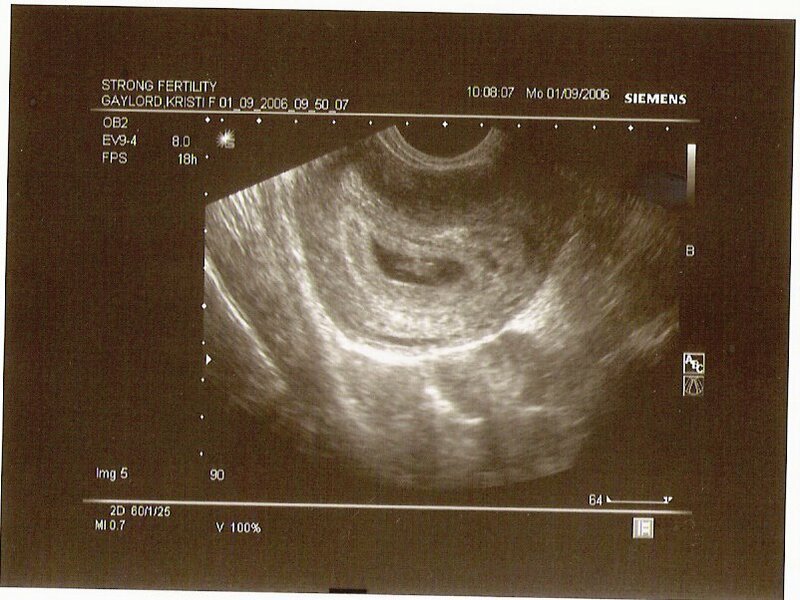 If I hadn't been seeing a fertility doctor, I wouldn't have seen the confirmation of my pregnancy at 7 weeks. If I hadn't had that spotting scare last week, I wouldn't have seen the baby at 8 weeks. And now I'll have to wait to see the baby again for another 9 weeks? What? So, I'm having what's called an NT scan somewhere between 11 and 14 weeks. The doctor will perform an ultrasound and count the folds in the baby's neck to check for Down's Syndrome. Yes, I would have wanted this test done anyway because it's not invasive and doesn't have a miscarriage chance along with it as other genetic testing later on in pregnancy does. But I also want this test done so I can see the baby, and hear his/her heartbeat, because it's too soon to hear it on the doppler machine. In the meantime, we wait on limbo island, accepting congratulations from strangers that for some reason hardly seems deserved, and hoping and praying that everything is going well "in there." I wish I could advance the clock and have this baby deliver a resounding and painful kick to my abdomen. At least that way I'll know that there is, indeed, still a living being inside me. And to ease my control-freak tendencies, I ordered this: http://www.babybeat.com/rentstd-add.html. This is Chubbie. So called because she is, well, on the big-boned side. We also call her Marge, a la Large Marge from Pee Wee's Big Adventure. She enjoys snuggling, binge eating, and puking on our slipcovered furniture in the middle of the night, and then coming upstairs to jump on us in bed, while purring loudly in apology. Chubbie is mom to our two other cats, Claudia and Louie. Eight years ago she was found as a stray and taken to a local vet's office by a friend of a woman I used to work with. The vet discovered she was pregnant, so they kept her there until she gave birth. The woman I worked with then posted to our company bulletin board about the availablity of five kittens for adoption (the woman who found Chubbie was originally going to keep her). Two of my friends and I went down to the vets, and one friend decided to take home the all-black kitten, and I opted for a pair of kittens who were hugging eachother in the back of the cage. We would return in a few weeks once the kittens were weaned. 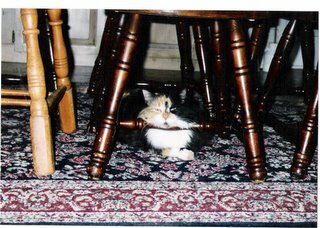 When it came time to bring the kittens home, I returned to the vet to pick them up only to find out that the woman who had wanted to take home Chubbie had changed her mind. I couldn't take her last two kittens away from her and leave her in the cage all alone, so Chubbie came home with us too. And the rest, as they say, is history! 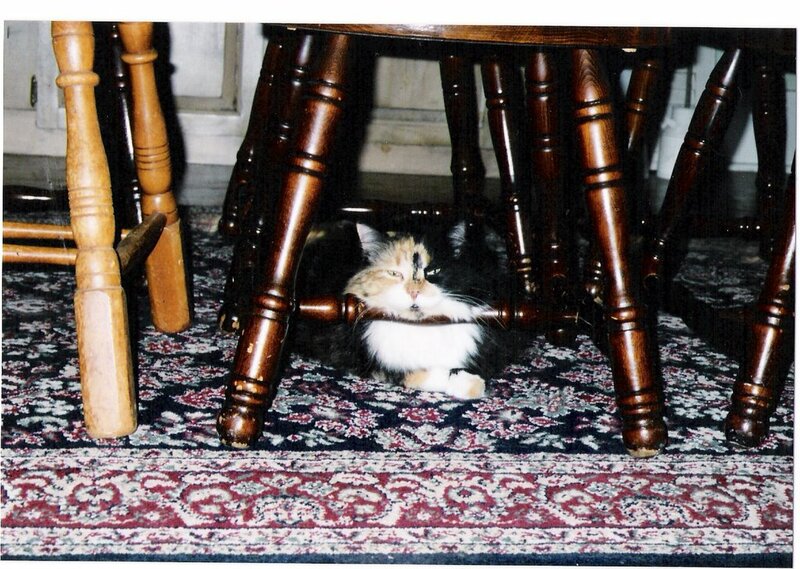 Head on over to Clare's, our charming host for WCB, to see other photos of adorable kitties. You may have noticed in the comment section of my last post that my sister called me "Shish." And you may have asked yourself, as many have upon hearing this strange name, "Who or what is a Shish?" Let me tell you how this nickname was born. When I was a little girl and just learning to talk, I couldn't pronounce my name. So, "Kristi" came out as "Shishi"(rhymes with "swishy"). And apparently I referred to myself in the third person quite a bit, because I'm told I'd say things like "Shishi make a mess," "Shishi wants to go NOW," and "Shishi hungry" (yes, apparently I was quite the dork when I was younger). Anyway, the name stuck. I will turn 30 in less than three months. And my relatives, friends, and even my husband still call me Shishi or Shish (for short) today. They use this nickname more often than they use Kristi. I actually like it. There are a million "Kristis" in the world, but I bet there aren't that many "Shishs." Do you have a nickname that's stuck since childhood? This is one of my all-time favorite quotes. I have it scrawled on a yellow Post-It note and taped to the wall of my cube here at work. The posting of this quote is two days late, but I didn't want to pass by the opportunity to reflect on what it means to me. I consider myself a social activist. Not in the sense that I'm front and center in picket lines (although I do have a fair share of experience participating in animal rights protests when I was younger), but that I care deeply and passionately about the issues that affect the environment, animals, and racial, ethnic, and other minorities. And I cannot remain silent when I see or hear about others seeking to turn back the clock on the advancements we as a country have made in these areas. For example, last week's Alito hearings angered me. The man is a master side-stepper, and I believe, a liar to boot. He was intellectually dishonest in answering the senators' questions regarding his abortion views. I firmly believe this man is 100% for outlawing abortion in this country. If he gets confirmed (and I think he will), I am truly afraid about what it will mean for Roe vs. Wade. This week's story in my local newspaper enraged me. Why aren't these individuals being charged with felony animal cruelty, a charge that results in a five-year prison term? FBI studies have shown that many of those who abuse animals end up hurting people as well. This article reports the results of a survey which found that 70.3% of women in domestic abuse shelters reported threats to or actual harm of pets, with 54% of them reporting actual harm. Ted Bundy, Jeffrey Dahmer, and David Berkowitz all abused and killed animals. And last year's spate of states outlawing gay marriage disgusted me as well. When will this country realize that two people, regardless of gender, commiting themselves to each other for life is not eroding the moral fabric of this country? Drunk heterosexual celebrities marrying eachother after a night of partying in Vegas (a la Ms. Spears) is fine, but a gay couple in a ten-year relationship cannot make their bond legal? When will the ignorant leaders of this country realize that there are more important issues facing us daily than boys (or girls) kissing? In my opinion, MLK's words are more than a call to action. For me, they represent a way of life. It's easy to not take the time to dissect how you feel about the stories you see and read about in the news every day. Becoming emotionally involved with the injustices in the world around us takes its toll. But for me, when these topics come up in discussions, I speak my mind. And at least where my very conservative family is concerned, I am the lone voice of dissent (read: reason). But to do otherwise is to silently acquiesce. To remain quiet is to condone the injustice. I will not let this happen. I'm going to tell you a story about my grandma, shown here with me on Christmas Day in her kitchen. My grandma practically raised me when I was a little girl. My sister and I are only 17 months apart, so when I was little, my grandma would often pick me up at my house and take me to hers so that my mom could deal with my sister, who according to my mom, "loved to hear herself cry" (sorry Karrie!). My grandma became a grandma at a young age: 46. And she is blessed with the youthful look so many in my family have, so when she would take me places people often thought I was hers. And my grandma, very flattered of course, let them believe that. I spent so much time with her, starting at a very early age, and because of that, once I became old enough to voice my opinion, I was adamant that I never wanted to leave her house. I wanted to move in with her. Spending the night at her house whenever my mom would let me, and then most weekends once I went to school wasn't enough. It wasn't that I didn't love my mom. 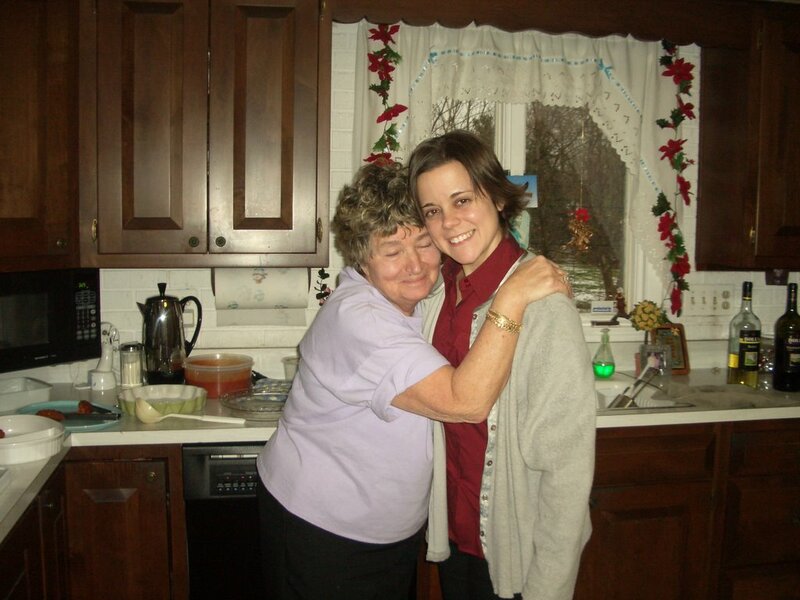 It was both that I was deeply attached to my grandma, and that she spoiled me rotten. I didn't have to share attention with my sister, as I did at home. So, I pitched many an angry fit when my mom would arrive to take me home. I truly considered her my second mother, and she thought of me as her sixth child. My grandma became my rescuer, too, during several incidents when I "acted out." When at four years old I decided to hack off my three year old sister's almost waist-length blond hair the day before my mom was to take her to get her photos taken, my grandma sped over to my house, scooped me up, and prevented my mom from murdering me. And when I threw a wooden block at my sister's head, which resulted in four stitches, my grandma saved me then too. In many ways my grandma is the typical warm, loving Italian grandma. She is an excellent cook (although she does not bake. She leaves that to my great aunt). She is generous to a fault, spoils her grandchildren, welcomes her kids' and grandkids' friends into her house with open arms, and is always trying to feed everyone, all the time. But in many ways she isn't the typical grandma at all. There are no rooms in her house that are off limits. There weren't fragile knick-knacks that her grandchildren lived in fear of knocking over when we were younger. I didn't have to stay quiet in her house, or go to bed early when I slept over. As a grew into a teenager, and wanted to spend time with my friends on the weekend rather than sleeping over at her house, I know she began to long for the times when I was little and was always hers. And she still tells me so today. She is nostalgic for the past in the way I think few people are. Because in many ways time stopped for her when my papa died from cancer, 11 years ago this coming August, at the young age of 69. My grandma and papa were married for over 40 years, and when he died, a large part of her did too. She lost her lively energetic spirit. She lost the ability to celebrate any special occasion without shedding tears for my papa, as she wished he could be there with her. Her house is a shrine to my papa, with photos of him everywhere. It's almost as if she believes that if she can't see his face everywhere she looks, she will forget him. She doesn't realize that he is with her always, even when she can't see his face. It kills me to see my grandma this way, when I know what a different person she was before my papa passed away. The baby I am carrying will never replace my papa. I know she will miss him as much as she did before. But I do not think it's a coincidence that assuming that all goes well, this baby will be born in August, the month in which my papa died. I want this baby almost as much for myself as I want it for her. A new life has a way of changing people, and I believe this baby will change her for the better. I woke up last night about midnight to use the bathroom. And there was pink on the toilet paper. I was seriously frightened. I woke up husband and he tried to calm me down. I knew in the back of my mind that this kind of thing is common in early pregnancy. I knew that there wasn't a lot of it, that it was pink and not a more ominous red color, and that upon repeated trips to the bathroom, no more was found. But I was freaking out all the same. I called my OB's emergency after-hours line. The answering service rep. took my name, number, and symptoms, and told me a doctor would call me back. One did, not five minutes later. I told him what was happening, and he very casually told me "it was probably just cervical bleeding" (What?) and that it's very common. Um, okay. It's not common for me! He said to call my doctor's office in the morning and make an ultrasound appointment just to make sure. He could have been prescribing advice for someone with a stubbed toe instead of someone terrified that she was about to lose the baby she has tried for two years to conceive. So, I tried to get some sleep. On top of all this, I came down with a cold yesterday, so I was having a hard time sleeping for that reason too. I called my doctor's office this morning, got an ultrasound for 10:15am, and...everything was fine. I had my very first tummy ultrasound. No wand! The ultrasound tech squeezed the gel on my stomach, and immediately we saw the baby, who is so much bigger than he/she was last week at this time. She pointed out the heart, which was beating very quickly, and we got to hear the heartbeat for the first time, which was incredible. She scanned my whole uterine cavity looking for the source of the bleeding and couldn't find any. Apparently, sometimes this "just happens." Great. Last Friday (hmmm, technically that was last week. Anyway...) husband and I went to see Brokeback Mountain. I've been waiting for this movie to come out for six months, and it hit the theatres Friday in my city as a "pre-release." I read the Annie Proulx short story, part of a collection in Close Range: Wyoming Stories, last year. Forget all your preconceived notions of what this movie is about. It's a love story. It's not "that gay cowboy movie." It's not X rated. In fact, I think it barely deserves its R rating. It is magnificently acted (I was never a Heath Ledger fan before, but now I completely understand why he's getting all the Oscar buzz for his role in this movie). And of course, Jake Gyllenthaal was incredible. I've been a fan of his for quite some time (wink, wink). It is beautifully filmed. The sweeping shots of Big Sky Country in Wyoming are breathtaking. It's never been a part of the country I've wanted to visit before seeing this film. And its story will break your heart. If you've seen it, let me know what you think. This week at work, I had to interview several people for the graphic designer/web developer position that's open in my company. Last week my manager and I conducted phone screens of potential candidates, and this week we brought three of them in for face-to-face interviews. The person who held the job previously is moving to NYC (lucky him!). The person who replaces him would be the only other person in my department besides my manager and me. I work for a very small company, and I work very closely with the graphic designer. So it's important to me to hire someone who is both talented, and with whom I am compatible. It was somewhat incredible to see that two of the three candidates we interviewed did not bring a portfolio of their work with them. All of them had experience, and they were interviewing for a design position. Where was their work? As a writer, I can't imagine going on an interview without samples of my work by which my potential employers can judge my ability to do the job. Yet only one of the people we brought in brought a portfolio. And it turned out this was the candidate that I liked best of the three, but not for this reason. Her work was clean, polished, and professional. She was an artist, and not just a techie. Now, in order to succeed at this job, the right candidate does need a certain amount of web development and coding skills, but if the candidate doesn't have a "designer's eye," I don't think we should hire him or her. She was the only one of the three who did. We have more interviews next week, and that's fine with me. I'm not 100% sold on this candidate, but she's my favorite of the three so far. And finally, my Christmas decorations. Yes, you've read that correctly. It was just this week that I de-Christmased my house. Pathetic, I know. But I have been so tired when I've arrived home from work that I've had no energy to take down and put away the substantial holidays trimmings that have been all over my house for over a month. 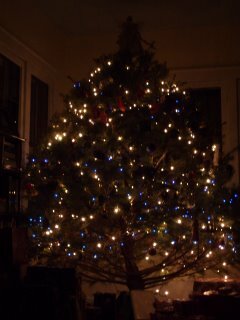 So I did it little by little, finishing last night by taking the ornaments off the tree. Now we just have to somehow drag the behemoth outside. We always take our tree to the recycling drop-off point in the park near my house, but this year I'm not sure it will fit in my husband's SUV. He's not going to like it, but I'm going to ask him to at least try. 1. Eating meals consisting of foods I haven't eaten either A) Since I was a toddler and not choosing my own food or B) Ever can wreck digestion havoc on one's intestines (or intestine if you're like me and only have one). I have radically changed my eating habits in order to provide the baby with proper nutrition. My eating habits and food choices prior to becoming pregnant were pretty pathetic, and vegetable-free. Now, I'm attempting to eat some vegetables with every meal. However, pregnancy apparently slows down the digestive process because of the presence of progesterone and relaxin (yes, that's an actual hormone). I've found out this little nugget of truth several times over the past few weeks. On New Year's Eve, it took my husband and I four hours to watch a two-hour movie on DVD. And last night, I probably got about three hours of sleep. Why, you ask? I was constantly running to the bathroom. Enough said. 2. I need to get used to the "chesty look." I've always had a pretty large chest. However, in the past year, I lost some weight, and therefore went down a few sizes. I was much enjoying not resembling Pamela Anderson. However, almost immediately upon becoming pregnant, my chest grew...and grew. It's pretty incredible, actually, how quickly this happened. Good thing I kept some of my old bras. 3. I also need to relax. I consider myself a magnificent example of a Type A personality. I am tightly wound, always on the move, and I do not know how to let my body rest. Prior to starting my injectible IVF meds, I came home from work and ran five miles a day, six days a week. Now when I come home from work, I run to the couch. I am wiped out. If I let myself, I could fall asleep for the night at 5pm. I'm hoping these feelings of exhaustion go away soon, because I feel lazy simpy doing nothing. 4. While I did see the proof on the monitor yesterday, I am still having a hard time believing I'm pregnant. I know this is an infertile thing, but I know I'm not infertile anymore. This baby was made 100 times more real to me yesterday, but I literally cannot believe that after all this time, it's actually happened. What's wrong with me? I think I'll still be shaking my head over this until the kid goes to college. 5. Science is cool. I was a Humanities girl in high school and college. I loved English and History, and was absolutely terrified of Math and Science. Formulas, theories, and numbers scared the sh*t out of me. Give me a novel any day. Until we started to try and have a baby, and it became painfully obvious how little I knew about my own body and its cycles. Throw in two years of infertility treatments, procedures, and drugs, and then finally sprinkle with a handful of embryos, extracted from my ovaries, fertilized in a lab, and then stuck into my uterus, and now I have a whole new appreciation for science. Math, however, is still my arch enemy. At my ultrasound this morning, we were able to see one perfectly sized baby floating around in my uterus. I am currently 7w1d, and we were able to see the heartbeat (more of a flicker, really). The heartbeat measured 123bpm, which my doctor said was very good. And the doctor wiped away many of my fears by telling us that once the heartbeat has been detected and measured, the risk of miscarriage is very low. I am due on August 26th. I have to continue with my morning progesterone shots until I am 10 weeks along (January 29th), which is fine with me. But best of all, I am done visiting my fertility clinic, which has been an unwanted home-away-from-home for the last 16 months. I've "graduated" back to my regular OB, with whom I have an appointment on January 25th, when I'll be about 9.5 weeks along. Both my husband and I are ecstatic. 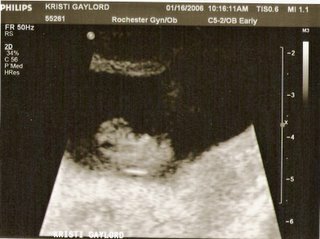 When I saw the baby, and my doctor pointed out the heartbeat on screen, the tears started flowing. Suddenly, this baby has become real for me. He or she is not just something a nurse told me was there over the phone a few weeks ago. I've seen him/her with my own eyes. There is a life growing inside me. It's real. I haven't been sick (just a few days of slight morning nausea, and I did vomit one day last week), and other than fatigue and breast tenderness, everything has been going fine. But I wanted an outward sign that things were progressing as they should, and even though it sounds strange, I was almost wishing for morning sickness. But now I know that things, at least at this point, are going just as they should be. We've been given an incredible gift, and although I am far from having a baby in my arms, I think I can finally breathe a little sigh of relief and celebrate this miracle a bit more. 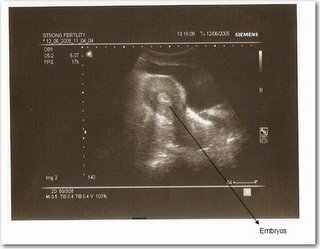 I also have an ultrasound photo that few women have. 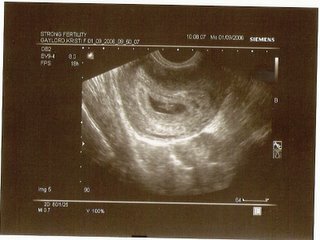 The photo below shows the baby, along with the one that "didn't take" on the day of my embryo transfer on December 6th, as an 8-cell mass. Science is incredible, isn't it? And to make this day even more incredible, as my husband was putting on his shoes this morning, he saw something on the floor. I was already at work, and he called me up and asked me if we were normal, rational people. I said, "Sure. Of course." He was questioning what he saw, because on the floor in front on him? Was a ladybug. Here's a wrap-up (mainly food-related) of my Christmas this year. All photos are courtesy of my sister Karrie, because as ya'll know, I don't have a digital camera. 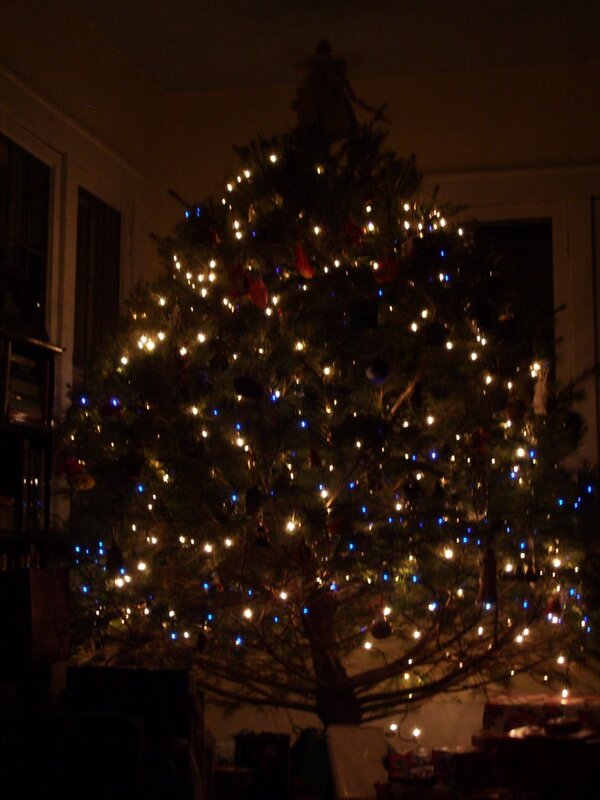 Here is my Christmas tree. It is enormous. It wasn't this large when we brought it into the house. I have no idea how we're going to get it out. 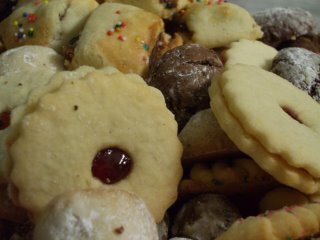 Here are just a few of the over 3,000 cookies my great aunt bakes for Christmas every year. She ships them all over the country to out-of-town relatives, and of course us lucky in-town relatives get to chow down on them at every family gathering. And here are the desserts I made for Christmas dinner at my grandma's house: Ricotta pie, peanut butter and banana pie, and of course, Dawn's pumpkin cheesecake. You can find the recipe for the cheesecake here. The rest I've included for your baking pleasure. 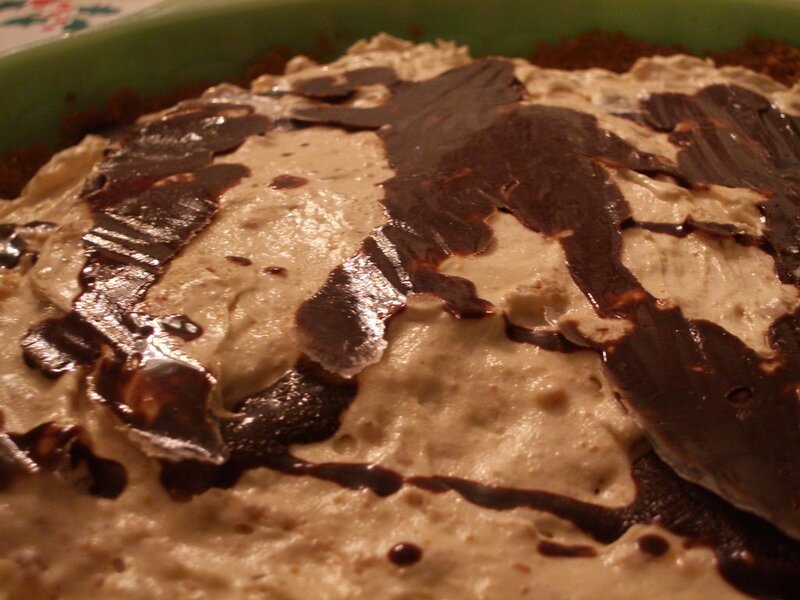 Place ricotta in a large bowl. Beat with electric mixer to break it up. Pour into greased and floured 9'' pie plate. Bake at 350 degrees for 30-35 minutes or until golden brown on top. Cool and then refrigerate until set. 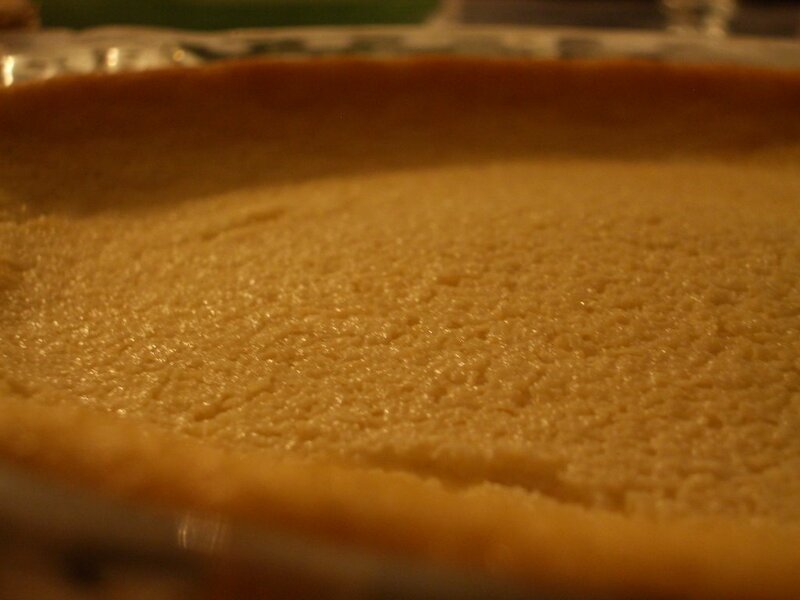 To prepare crust, place cookies in a food processor and process until finely ground. Add 1/3 cup brown sugar and butter, and pulse 2-3 times until just combined. Press into bottom and up sides of a 9'' pie plate coated with cooking spray. Bake at 350 degrees for 10 minutes, and cool completely on a wire rack. To prepare filling, place 3/4 cup brown sugar, cream cheese, peanut butter, and vanilla in a bowl and beat with an electric mixer at medium speed until smooth. Arrange banana slices in bottom of prepared crust. Spread peanut butter mixture over banana, and drizzle with syrup. Cover and freeze for eight hours. My pal Alisha over at Playin' Whaley tagged me (actually, she tagged anyone who wanted to play along) for this fun meme. 2. Travel extensively around the world. 4. Fashion myself into an accomplished baker. 5. Pluck up my courage and keep my emotions in check enough to volunteer at an animal shelter. 1. Watch an animal suffer. 3. Not offer an opinion when asked (and sometimes completely unsolicited). 6. Avoid editing menus, billboards, signs, etc. in my head when I see grammar or spelling errors. 1. Having an outlet and permanent record for my daily thoughts. 2. Getting to know people who are both very different and eerily similar to me. 3. Being able to vent about my mother's husband without the messy (though very real) possibility of bloodshed. 4. Peering into others' shared lives and realizing that I'm not alone in the world with my personal struggles. 5. Experiencing first-hand the kindness of my blog friends. 6. Receiving and giving support. 7. Indulging in an excellent work-procrastination exercise. 5. Did you write that withdrawl in the checkbook? 6. Do you want to answer the phone? Me either. And thank you to everyone who contributed their words of advice and comfort on my last post. They've helped me immensely. Since learning I was pregnant, I've been locked in an internal struggle. The infertile hat I grudgingly donned over a year ago doesn't seem to want to come off. I still think like an infertile. Talk like an infertile. Act like an infertile. I am having a hard time being happy. Now, I am over the moon about being pregnant. I feel so blessed because I know so many others would kill to be in my shoes. But, as morbid as this sounds, I think I'm pre-mourning the loss of this baby already, just as I was pre-mourning the news I just knew would come (but surprisingly didn't) informing me that IVF didn't work. And the internet isn't helping my cause. As the typical beaten-down long-suffering infertile would, I've been reading about miscarriage causes on the web. And I will admit, while some information I simply encountered accidentally, other information I actively sought out myself. Now, my head is full of such scary terms as "blighted ovum," "missed miscarriage," and "threatened abortion." I'm had no symptoms of any of these, yet as I've learned, you don't necessarily need any symptoms at all when you're having a miscarriage. It's the wrong kind of thinking. I know this. Optimism and positivity are huge parts of having a successful pregnancy, and I know that the internet is full of all kinds of horror stories and even flat-out wrong information. My head knows all this. My heart is just seeking to protect itself from becoming too attached to something that could be gone in an instant. I think this will get easier if we have a successful ultrasound on Monday. That appointment can't come soon enough. Once I can see the baby and hear his/her heartbeat, this pregnancy will feel more real to me, and I think the baby will feel more mine. And I know I have to abandon my negative thinking and stay off the internet. But I am one who likes to be in control and know what potential pitfalls I could face well in advance. It's the researcher and bookworm in me that will never be quieted. How can I reinvent myself as someone who CAN get pregnant and who, at least for right now, IS going to have a baby when I've spent so long with the identity of an infertile wrapped securely around me like a blanket? I didn't anticipate it being this hard. And my ridiculous bravado over the pumpkin cheesecake I made a few months ago did me in, along with an inability to lie (well, at least to her). But all is right in my world, because she is happy for me. She is thrilled at the prospect of becoming an auntie, and she was more supportive and loving in expressing her joy than I ever could have imagined. I am so lucky to have her as my sister. On the first night my sister was in town, my husband, she, and I were sitting around in my living room talking. And out of the blue, she asks me if I have a blog. "Uhhhh...yes?" I said, caught completely offguard. She then asked me which blogging site I use. And...I told her. She asked for the name of my blog, and I refused to give it to her. She then dropped the subject. Later, my husband tried to convince me that Karrie (my sister) was going to find this blog. I didn't believe it, though, because I figured that there must be millions of blogs on Blogger. She'd never be able to find mine. And truthfully, with everything else going on during the busy week she was here, I forgot about even having told her about the blog. Until yesterday. My sister called me. And she was crying. I was immediately worried, thinking something was wrong. Instead, everything was right. Exactly right. She said "I just posted to your blog!" And after a long pause, during which I registered exactly what it was she just told me, and therefore what she had just found out, I said, "Suprise!" My sister was completely and unequivically thrilled for me. Through her tears she expressed how happy she was at the thought of becoming an aunt. How she wished I had told her sooner about the past two years of infertility so she could have been there to offer support, but that she understands why I didn't. And she echoed my exact thoughts of how this baby, should everything go as we so hope it does, will change my family for the better, and how much this baby will mean to our grandmother. She even asked me to tape "the telling" so she can see the expressions on our grandmother's and great aunt's faces. And she even made mention of looking for a new job on the East Coast, something she never has brought up before. And while I'm not expecting anything, and certainly wouldn't fault her for staying in Seattle, it would be incredible beyond words to have my sister closer so she could play a more active role in her niece's or nephew's life. So I am happy that she knows, relieved at her reaction, and feeling silly for doubting that she could be happy for me, despite her feelings about children. And now, no matter what happens, I will have her support, which is invaluable to me.